Last Friday, my Chief Culinary Consultant and I decided to take a little afternoon field trip and drove to the outlets an hour north of where we live. Upon arriving, we headed straight for the food court in do-not-pass-GO style, and grabbed hot pretzels for sustenance before starting our shopping. As we left the food court, we immediately ran into the Rocky Mountain Chocolate Factory. As soon as I saw the caramel apples in the window, I realized that it was the same chocolate shop we visited in Toronto, which was inspiration for my homemade caramel apples. Since we had just eaten pretzels, we decided to hit up the chocolate store on our way out so we’d have some goodies to enjoy on the car ride home. A few hours and many shopping bags later, we found ourselves back there, staring at the cases of chocolate treats, trying to decide what we wanted. In the end, we settled on a buckeye caramel apple (mmm peanut butter, caramel and chocolate! ), a chocolate-covered graham cracker, and my Chief Culinary Consultant eyed the avalanche bark in the case, so we got two pieces of that. 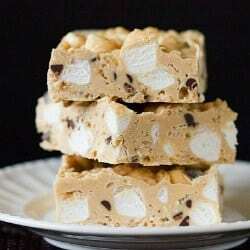 Turns out, avalanche bark is quite possibly the best thing, ever. The avalanche bark from Rocky Mountain Chocolate Factory tasted like part fudge, part Rice Krispies treat, and part chocolate bark. By the time the second piece had vanished, my Chief Culinary Consultant asked if I could recreate them. Like, immediately. Luckily, Rice Krispies treats and chocolate bark are among the easiest and quickest chocolate goods to whip up, so this didn’t take long at all. You can play around with the ratios of white chocolate and peanut butter, based on how much you like one or the other. 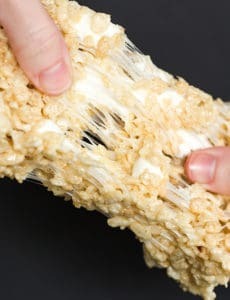 You can also make it more or less crispy by altering the Rice Krispies, and more or less “chewy” by increasing or decreasing the amount of marshmallows. Any way you make them, you are going to LOVE them! These were the perfect end to a wonderful impromptu shopping trip, and my guess is they would be a fabulous addition to any day of the week, no matter what you’re doing. A recreation of the popular Avalanche Bark from Rocky Mountain Chocolate Factory. Line an 8-inch square pan with parchment paper; set aside. Place the miniature chocolate chips on a plate and place in the freezer until ready to use. Combine the white chocolate and peanut butter in a mixing bowl and microwave on 50% power in 30-second increments, stirring after each, until completely melted. Remove from microwave and stir in Rice Krispies. Let the mixture sit and cool until it reaches room temperature, stirring occasionally, about 10 to 20 minutes. 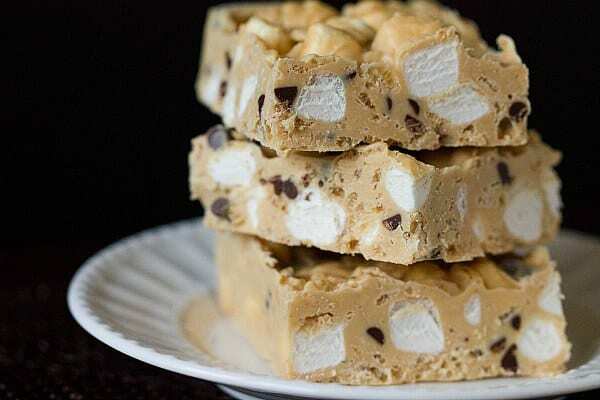 Gently stir in the miniature marshmallows, then the miniature chocolate chips. Turn the mixture into the prepared pan and press into an even layer. Refrigerate until set, about 15 minutes. Remove from the pan and cut into squares. Store in an airtight container in the refrigerator for up to 1 week. Can these be made up a week ahead of time and kept in the fridge? Thank You! 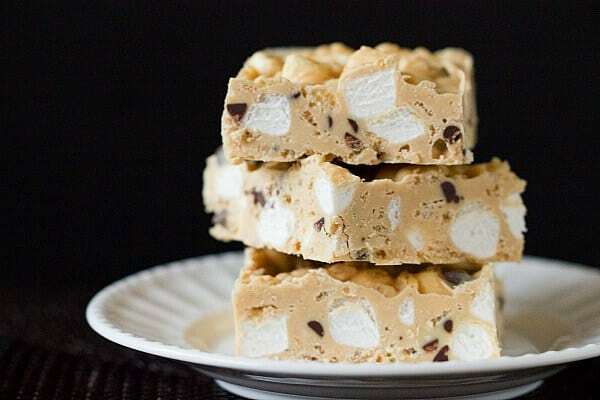 Love this – also a fan of the RMCF Avalanche bars; this recipe certainly nails the taste test. I’m a total oaf in the kitchen – I can even manage to burn a bowl of cereal. I’ve made this three times now and all of a sudden my family thinks I’m a snack chef. Too easy…..Thank you – plus, it saves us a ton of money versus RMCF Avalanche prices. Hi! Just wondering, are these GF? Or vegan? I’m not familiar with the rules. Just curious!! Hi Jodi, I would say not vegan, as I think most vegans don’t eat marshmallows because gelatin (used in making marshmallows) is derived from animals. As for gluten-free, they could be, but you would need to check the actual labels of the products you use to make sure. These are the perfect treat for a snow day! But honestly who needs a snow day? Perfect for today! Thanks! It’s easy tasty and is loved by all. I high recommend trying this promise you won’t be disappointed…I wrapped mine in plastic wrap then stored in Tupperware. Thanks for the recipe! 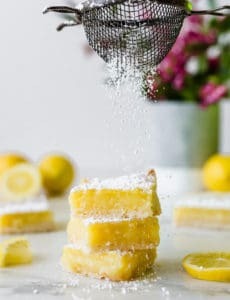 I had something similar at a local bakery and loved them, so I started searching for a recipe and I was excited to see that one of my favorite bloggers is way ahead of me! I just made two batches for a potluck. Stir in chocolate chips, but don’t add in until the mix has cooled a bit, otherwise the chocolate chips will melt (unless you like that). Then, pour out onto a large flat pan that is covered in wax paper. Flatten out to desired thickness, and let sit for about an hour or 2 before cutting. If to be consumed at a later point in time, refrigerate but remove from refrigerator a couple hours before serving. Since then I have experimented a bit and found that whipping the daylights out of the peanut butter makes them light and fluffy. While you’re whipping it in a high speed mixer add some unsalted butter and some powered sugar. I’ve not nailed down any specific measuring yet. Another interesting alternative is to use crumbled oreos (remove filling) instead of chocolate chips. The white chocolate is chopped because it melts much faster and more evenly than if left as a big chunk, which cuts down on the risk of it overheating and seizing. Hum…can’t say I’ve ever had an issue in over 20 years. Are you using bars or morsels? We only ever used morsels. Either bulk Callebeaut or Valrhona in wafers. I actually despise using white chocolate morsels – I find them to be extremely chalky. I know this is old but I wanted to thank you for the actual recipe! I’ve had the hardest time (and tried a lot of recipes) getting the right texture but this produced exactly the bars i was hoping for– just like the RMCF I used to buy from before I moved. I made 3 batches of this bark over the holidays, was a HUGE hit with everyone and very easy to make! Thanks for the recipe! I made this bark for the first time the other day, and my family really likes it. Unfortunately, the bark was awfully crumbly, which made cutting it difficult. (In fact, I ended up with a pile of “crumbs” that I plan to mix into homemade ice cream. Yum!) I would like to make the bark again. Do you have any suggestions for correcting the problem I had? Thank you so much! Hi Jocelyn, Perhaps the mixture sat too long during step #3 or the melted mixture was cooked too long in the microwave. OK – The first time I made these I don’t know if they sat too long cooling or something else. They kind of fell apparat BUT everyone loved them anyway. 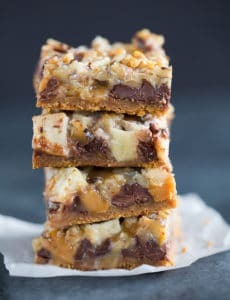 The second time I mad them I left the peanut butter – white chocolate – rice krispies mixture about 15-20 minutes and didn’t freeze the chocolate chips and they turned out perfect. Now people I shared them are calling them Dreamy Bars and I agree – they are dreamy and I can’t keep them in my house. p.s. If you can refrain from taking little spoonfuls of the white chocolate-peanut butter = rice krispies mixture as it cools – yo’re a better person than me! I finally made this and it came out excellent. It is rich, but the flavors are great together. I also thought it was fairly quick and easy to make and will definitely use this recipe again! : ) Thanks for sharing this recipe!!! Nvm! I just read the instructions again and seen it lasts for a week in an air tight container! Can’t wait to make the recipe. I’ll report back once it has been made :). Cheers! Super easy and super delicious! A little different than the real version but definitely satisfied my craving! I just made a Christmas variation of this recipe today. Instead of peanut butter and chocolate chips I used almond butter, chopped pistachios and chopped candied cherries. I also added a 1/4 tsp almond extract and 1/4 tsp salt since the almond butter has none. Can’t wait to taste how they turned out!! OMG!! Thank you thank you thank you! I have made several of your recipes but this one by far is one of the best! Everyone that tries this loves it and asks for the recipe. I had some white chocolate chips left from Christmas baking and used them..so simple and delicious. This is a keeper for my cookie platter presents. Thank you! I picked up a slab of the bark at the Grove City outlets a few weeks ago. After tasting it, I wasn’t sure that I wanted to try your recipe. But…I’m glad I did. It tasted so much better than the one I purchased (it was pretty dry). I’m making this to give out as treats on Christmas Eve. OMG–did you get a look at their giant buckeyes? Hi Lisa, I did see those giant buckeyes, LOVE! 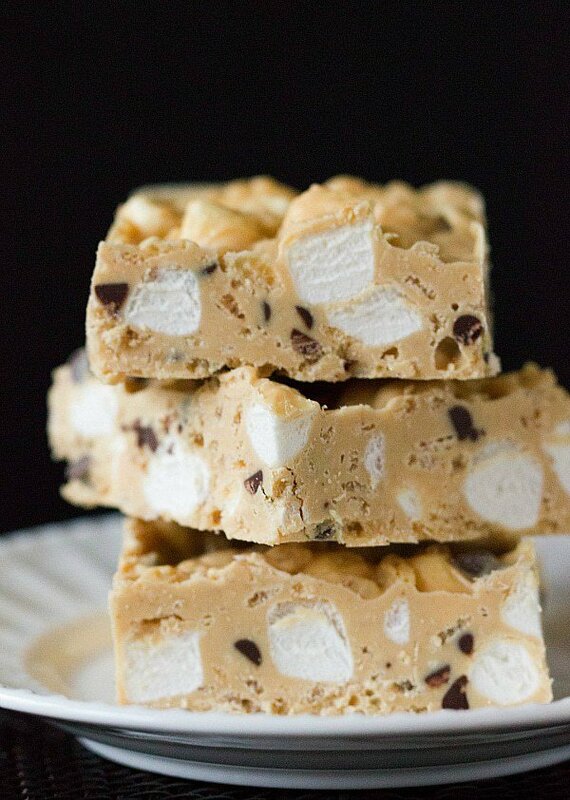 So thrilled to hear that you loved my take on the avalanche bars! This is the only item I ever get at Rocky Mountain Chocolate Factory, thanks for the recipe! I’m wanting a bit more of a peanut butter flavor so was going to up it from 1/2 cup to maybe 2/3 or 3/4 cup, should I change the amount of white chocolate or rice krispies so the consistency stays the same? Hi Tanya, I think you could increase the peanut butter to 2/3 or 3/4 cup without changing the other quantities. Let me know how they turn out! Finally made this again and I used 2/3 cup of peanut butter – tasted fantastic and had more peanut butter flavor but without being overwhelming. Yum! I made this this weekend and took it to a birthday party. Luckily, I left the container there (although it was quite by accident) otherwise I would need to go shopping for larger pants! :) So yummy. Thanks for sharing!